CAIRO, Egypt — Millions of people across several African countries and Yemen are in imminent danger of death from starvation and poverty-related diseases if help does not come soon, according to a group of international aid agencies. The crisis in 10 countries including South Sudan, Yemen, Somalia and Nigeria is dire, with 20 million across the region at risk of starvation, according to the latest U.N. figures. The situation in Yemen is being described as the "largest humanitarian crisis in the world,” with a total of 20.7 million people in that country alone — 10.3 million of which are children — in desperate need of help, according to figures from Save the Children. Various bloody conflicts and terror organizations operating in the region have exacerbated the situation. War in South Sudan is forcing people to flee to refugee camps where there is little food available. In Nigeria, where Boko Haram is fighting the government, much of the farmland has become inaccessible or too dangerous to farm. 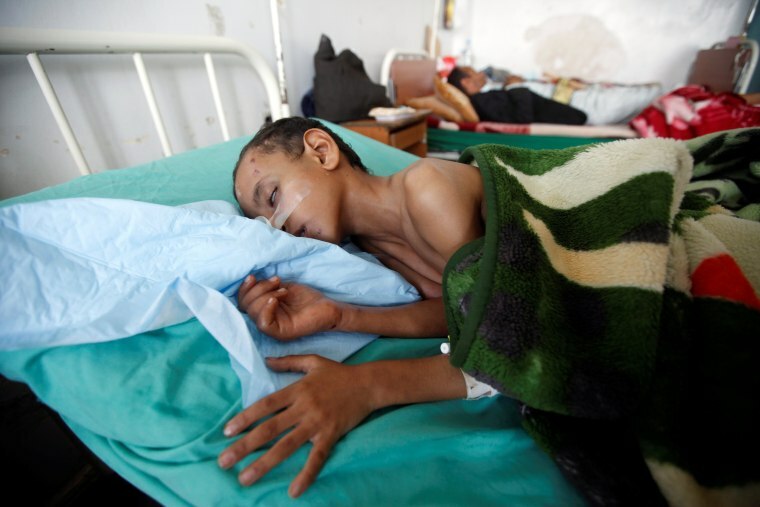 In Yemen, cholera is ravaging the population at an alarming rate. The situation is caused largely by attacks on vital infrastructure, leading to diminished access to clean water, food, medical care and work. Famine has not yet been officially declared, but aid agencies believe that by the time it is, it will already be too late. In a major push to avert complete disaster, eight U.S.-based relief agencies have joined forces to launch a two-week fundraising appeal. The Global Emergency Response Coalition, which includes World Vision, CARE, Save the Children, Oxfam, and Mercy Corps, say the situation is critical and people need help now. "We know that when the funding is available to help, we save lives," said Margaret Schuler, senior vice president of international programs for World Vision. "When we wait to respond until a famine is declared, it is simply too late. To save lives, we need more than compassion. We need Americans to see those in need and not turn away." According to the U.N., in Yemen alone, a child under the age of five dies from preventable causes every 10 minutes, and 7 million people are on the verge of famine. In Somalia and Nigeria, another 7 million people don’t know where their next meal is coming from. "It is the largest humanitarian crisis in the world," Anas Shahari, Save the Children’s media officer in Yemen, told NBC News from Sanaa, Yemen's beleaguered capital city. "Cholera is just getting everyone. I see very poor people with very limited income coming to our clinics and seeking treatment from cholera. They are in terrible condition and they need all help we can provide. Not only for treatment. They also ask for water, and a little money to go back to their homes." Since October 2016, cholera has infected 400,000 people and killed almost 2,000. In Kenya, the situation is similar, with children regularly dying of malnutrition, according to Erin Taylor, Save the Children's media director. "We are seeing families having to make the choice of bringing the healthier child in for health screenings and malnutrition screenings and some of the weaker and sicker ones are at home and don’t make it to our centers before they die," she said. While aid has dried up and starvation looms, relief workers have been moved by the decency of people, even some of those in the greatest need. “I met one woman who was traveling with 11 children, four of them were hers, three were her brother's. Her brother was slaughtered in front of her, and she also brought four children of other relatives. Three of the children were severely malnourished,” recounted Heather Higgenbottom, chief operating officer of CARE. She was alone because her husband had been killed. In South Sudan, 86 percent of all refugees fleeing are women and children because the men have either been killed or are involved in the fighting. Relief groups are calling on the United States government to keep on giving. Congress appropriated almost a billion dollars in humanitarian assistance this year, but “the Trump administration budget is proposing draconian cuts to humanitarian assistance at the worst possible time,” said Scott Paul, senior humanitarian policy adviser for Oxfam. Aid agencies are also asking the U.S. to help resolve regional conflicts, especially in Yemen where the U.S. supports the Saudi-led coalition with munitions and refueling. The coalition is at war with Houthi rebels who are in control of the capital Sanaa and much of the country. Their jets have bombed hospitals, factories and infrastructure, directly worsening the situation for civilians on the ground. But hungry families cannot wait for peace.